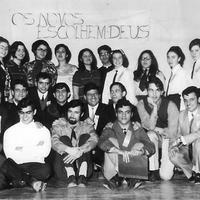 Image of a group of teenagers posing in front of a banner that says "Os novos escolhem Deus" (The young choose Christ). Sitting in the front row, with beard, is Domingos Marques. In the second row, third from the right, kneeling, is Martin Silva. In the back and center, behind the girls, is Fr. Cândido. "Looking at this picture, going back now forty years, I can tell you that when I arrived in Canada in 68, St. Mary's Church was the main centre... the most important church around the community in Toronto. Fr. Cunha had taken over for three or four years... from the initial organization of St. Mary's Church. He brought in a young priest, Fr. Cândido, who had been ordained in Braga (his hometown), and he brought him in right after he was ordained and he was very dynamic. The plan was [for him] to organize a youth group. When I arrived in 68 this group was just being formed and so, obviously, because I had... been in the seminary... I was someone that they felt could help in the organization. At that point I have not even made the final decision whether or not I would continue in the seminary... The timing [of the youth group] was right because there were very few organizations in Toronto for [Portuguese] youth. I can think about the fact that Portuguese parents wouldn't allow the girls to go out... There were no places for socializing, so the church was one of the few places that the parents were comfortable [with], and so it was an opportunity for boys and girls to meet. There were several activities. I remember theatre. There was a band that was formed: "Os Rebeldes". We used to meet every Sunday after church. There were activities, theatre, music... gradually dances were allowed. Still most of the girls were being chaperoned... most of the parents would hesitate to allow the girls to participate in the dance. But eventually the group grew larger and larger and we were able to have events [with] many hundreds of young people would participate. 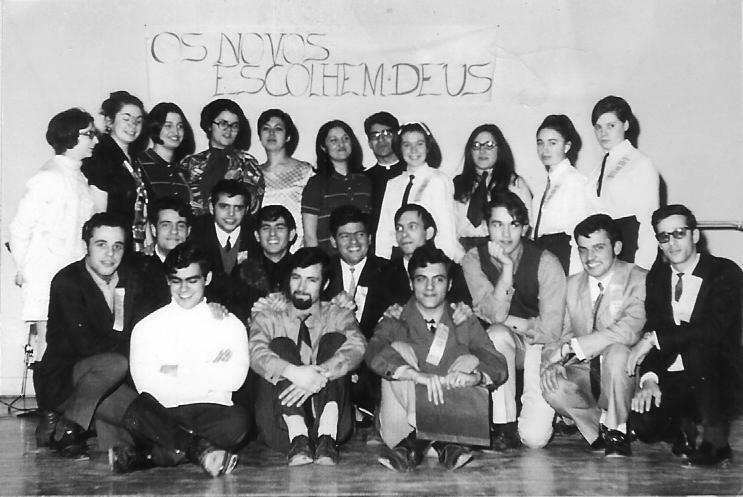 This particular photo that I am looking at - "Os Jovens Escolhem Deus" - this was probably some conference or major event that took place..."
"The most active period was like a year, I would say 69 and 70, when there were almost weekly activities of some sort. It would be an afternoon, there would be always the religious component... Obviously, this was organized by the church, so they wanted them to attend mass. Some of the young people, especially the boys, were not too keen on the idea of attending mass, but they were obviously hoping that after the mass the social part would (?) what interest them; and many of them attended. I remember many of my friends who didn't go to church regularly with their parents and they would have to stay there for an hour and stick with everybody else. For about a year, I would say 69-70, the youth group was quite active and we had excursions organized to different places, let's say we would go to Niagara Falls, or Kingston, or other [places]... basically bus loads. It was great for young people to meet... sei que houve pelo menos muitos namoros entre este grupo de gente que estou aqui a ver. Gilberto Fernandes: I remember you mentioned how this group eventually split between Fr. Cunha and another [parish]. Domingos: As I said, for a year or two [this group] was very active and very successful, many events took place and the organization became more solid. But eventually, as the youth started to... obviously they were already in this country, they were in high school, and they were not willing to continue to be... not just because they were young and natural more rebellious against authority, but also because the church, and especially Fr. Cunha and our organization [the Youth Group] eventually got into conflict. Fr. Cunha wanted to control and make decisions not in a very democratic way and eventually the group split. Basically, the more charismatic and the more dynamic people abandoned this particular church and moved on to another church. At that time, there was a Franciscan priest, Padre Neves, who had started at St. Agnes, on Grace, and most of the young people moved to that other church..."
"The unfortunate thing is that at the same time this rift happened... was at a time also that Fr. Cândido was ill. He learned that he had cancer, a tumour in the brain or something very serious. During that process where he wasn't able to be the priest in charge and Fr. Cunha had to be involved in the decisions also contributed to that [rift]. The group left before Fr. Cândido died but he ended up dying soon after that... Then the group left to St. Agnes; Alexandre Neves was the name of the priest. Eventually, while [Fr. Neves] was on vacation somewhere in Brazil - “he was Brazilian“ - another priest took over, Padre Antero Melo. Then when [Fr. Neves] returned and he had no church, he moved on to St. Helen's. So then this youth group, who had started in St. Mary's, eventually would follow Fr. Neves into St. Helen's." Domingos Marques, interviewed by Gilberto Fernandes and Susana Miranda, October 30, 2008. Audio recording: Gilberto Fernandes and Susana Miranda, “St. Mary's Youth Group (with audio commentary),” York University Libraries | Clara Thomas Archives & Special Collections online exhibits, accessed April 21, 2019, http://archives.library.yorku.ca/items/show/2400.